As you near completion of your degree, verify that you meet minimum degree requirements. Be sure to check with your academic program to make sure that you meet their requirements, above and beyond the Graduate School’s minimum requirements. Also be sure to meet the appropriate degree deadlines, listed at the bottom of this page. Then, review the following important resources, which will guide you through the final steps of completing your degree. Looking for Master's Degree Requirements? Click here for guidelines for completing your master's degree. Need support completing your dissertation? We can help. Campus offers dissertator support groups, dissertation writing camps, writing guides, and other resources. We encourage you to read through these requirements before you start writing. These guidelines will help you prepare your dissertation to ensure that it constitutes a permanent document of quality appropriate for a major graduate institution. Your dissertation is required to conform to these standards. It will be fully corrected, complete, and submitted electronically as a single PDF file. Electronic and paper copies of approved dissertations are sent to the UW-Madison Memorial Library. They can be found electronically on MadCat and the ProQuest database. ProQuest/UMI Dissertation Publishing archives all accepted dissertations. You may put unusual or supplementary materials (such as questionnaires or photos) into appendices. Number the appendices consecutively with the text of the dissertation. The formatting of the appendices must meet the standards for the rest of the dissertation. The bibliography should meet your major program’s style requirements, which often conform to the leading journals or book series of the field. They may be single-spaced with an additional space between entries. Equations, superscripts, and subscripts are acceptable in your dissertation provided they are legible when microfilmed. Generally, superscripts and subscripts may be one size smaller than the text. To identify each equation clearly, please isolate it with double spacing. Footnotes and endnotes may be single-spaced with an extra space between notes. Please follow the preference of your major program when deciding where footnotes or endnotes should be placed in your text. Figures and graphs must meet the same standards as the rest of the dissertation. Headings, keys, and all other identifying information must be of the same quality and format as the text. If graphics, tables, or figures are in landscape mode, orient the top of the printed page at the dissertation binding edge (left side of the paper) with the page number in the upper right-hand corner in the portrait page setup. Images may be submitted in black and white or color. You may include quotations in languages other than English in your dissertation. However, the dissertation itself must be in English unless your program certifies that one or both of the following conditions have been met: the foreign language is that of the readers to whom the work is addressed; or translation into English would make the study obscure and imprecise. Dissertations submitted by students from a language program are acceptable in the language of that program. Use a minimum of 1″ margin on all four sides. Page numbers must be in the upper right-hand corner at least a half inch from the top and one inch from the side of the page. Page Headers: Do NOT use page headers (except for page numbers) or decorative borders. The title page and copyright page (if you are retaining and registering copyright) are not counted in the numbering of pages. The other pages are counted in the numbering of pages. Number the preliminary pages (for example, dedication page, acknowledgments page, table of contents, and abstract) that precede the main text with lower case Roman numerals beginning with i. Put page numbers in the right-hand corner one inch from both top and side of the page. Page numbers half an inch from the top of the page are also acceptable. Number the main text consecutively beginning with Arabic numeral 1 in the upper right-hand corner one inch from both top and side of the page. Check your dissertation to ensure that all pages are present and in numerical order. If you are using Microsoft Word, directions about how to exclude title page, etc. in pagination can be found on YouTube here. Number appendices consecutively with the text, continuing the Arabic numeral sequence. Landscaped pages must have page numbers in portrait position and the top of the page must be on the left-hand, binding side of the page when it is rotated. If the page is *not* rotated, then the page numbers must be on the bottom, right-hand side of the page and sideways, so that when the pages are rotated, the page numbers are in portrait position. There are a number of ways to do this. For methods using Microsoft Word, such as text boxes, see instructions and examples here. Note that if you do not rotate the landscaped pages, you want page numbers to appear in the same position as the highlighted number 3 in the second row of examples. Use 10 to 12 point type. Double-space the main text of the dissertation. Lengthy quotations, footnotes, and bibliographies may be single-spaced with a double space between entries or paragraphs. Maps, charts, etc. are acceptable. The title page is the very first page of your dissertation. Do not number the title page. At the bottom of the title page, you must indicate the date you passed your final defense (final oral examination) and list your committee members’ names, titles, and programs. Follow this sample title page format exactly. If you are depositing your thesis in the window period then your title page should reflect the year in which your degree will be granted. For example, if you are depositing on December 21st, 2015, this falls within the Spring 2016 degree window period. The title page should read 2016 as the degree year since your degree will be granted in Spring 2016. When you deposit your dissertation electronically, ProQuest/UMI will require you to provide the text of your UMI abstract. Please have this text ready when you begin the online submission process. The abstract must be in English, must not exceed 350 words, and must be approved by your advisor. Your program may require an abstract to be part of the dissertation. Please follow your program’s style requirements, and number all of these pages as part of the preliminary material (use lower case Roman numerals). This abstract must be included in the table of contents. You may include a copyright page; if you do, insert it directly after the title page. Do not number the copyright page. View a sample copyright page. Center the text in the bottom third of the page within the dissertation margins. You are automatically protected by copyright law, and you do not have to pay in order to retain copyright. There is an additional fee of $55.00 for registering your copyright, which is a public record, and is payable to ProQuest/UMI at the time of electronic submission. If you register your copyright, ProQuest/UMI will send a digital copy of your dissertation to the Library of Congress. You are not required to register your copyright through ProQuest/UMI; you may choose to do it on your own. More information is available online at www.copyright.gov and from UW Libraries. After you submit the PDF of your dissertation electronically, you will not be permitted to make any additional corrections. Therefore, make sure the PDF is completely accurate before you submit. You are responsible for appropriate use of copyrighted materials in your thesis. Some material may be available for use without restriction while other material may require written permission from the rights holder. Other material may be appropriately used without written permission under the “fair use” provisions of the copyright law. General guidance regarding use of copyrighted materials is available from ProQuest/ UMI or from the UW-Madison Libraries. Fair Use: Read general information regarding how to determine if your use of copyrighted materials constitutes fair use. Additionally, your own professional or disciplinary societies may have fair use statements to help you negotiate disciplinary specialties. Written Permission: If written permission is required, you are responsible for obtaining such permission and maintaining records of the written permission to use the copyrighted material in your thesis. You can usually get permission by sending a letter of request to the copyright holder. Normally, your letter will be returned with an approval stamp or signature. Some copyright holders require a specific form of acknowledgment. A sample permission request letter is offered by ProQuest/UMI. Note that obtaining written permission can be a lengthy process. Plan ahead and budget ample time to obtain all required permissions. All dissertations are normally open and made available to the public shortly after you receive approval from the Graduate School. However, if a publication or a patent is pending, an embargo may be requested during the electronic submission process. On the ProQuest/UMI ETD Administrator site, you will have the option to select “No” to the Publishing Options question: “I want my work to be available in ProQuest as soon as it is published.” Next you will be prompted to select a time period of 6 months, 1 year or 2 years for embargo. These options do not require special permission but you should have discussed this with your advisor in advance. Any request for more than a 2 year embargo or an extension of the original embargo request will be reviewed by the Graduate School Associate Dean(s). Such a request requires a letter to be signed by the student and the advisor in advance. Please keep in mind that if you select an embargo, there will be no record of your dissertation in the public domain and no opportunity for citations. In addition, if you order a bound copy of your dissertation through ProQuest, you will not receive it until your dissertation is released at the end of the embargo period. You are responsible for completing all of the required steps below by the appropriate degree deadlines (listed at the bottom of this page) in order to graduate in the given term. The following information MUST be entered in the “Reason for the appointment” box. Failure to enter this information may result in your appointment being canceled. Notify your graduate program coordinator to have them request your doctoral degree warrant from the Graduate School. You must be enrolled during the semester that you defend and deposit; if you want to defend and/or submit your dissertation to the Graduate School in the summer term, you must register for 3 credits of research for the 8-week summer session. After your graduate program coordinator submits the doctoral degree warrant request, the Graduate School will review this request and send the approved doctoral degree warrant to your graduate program coordinator. The final warrant should be printed out and committee member signatures should be obtained at your defense. Once the final warrant has been signed, an electronic copy should be uploaded in the administrative documents section of the ProQuest/UMI ETD Administrator website. The original signed hard copy of the final warrant should be kept with the student or the graduate program coordinator. Go to Grad Portal to pay the required $90 dissertation deposit fee. The fee must be paid before submitting your dissertation electronically. The fee payment site provides an email confirmation with your fee payment receipt. You also have the option to log into the fee payment site and download a PDF of the receipt once you have paid. The receipt will be uploaded in the administrative documents section of the ProQuest/UMI ETD Administrator website. The following doctoral exit surveys must be completed before submitting your dissertation electronically. Each individual survey will provide a certificate of completion once you have submitted the survey. The individual certificates of completion should each be saved as PDF documents to be uploaded in the administrative documents section of the ProQuest/UMI ETD Administrator website. Survey of Earned Doctorates (SED) certificate of completion. To complete the online SED you will first provide basic information including your email address. You will then receive an e-mail with a unique PIN and password. Access the SED survey site using the URL, PIN, and password sent to you in this email, and complete the survey. You must advance past the certificate of completion screen in order to submit the survey. Graduate School’s Doctoral Exit Survey (DES) certificate of completion. The DES obtains information on your academic experience (e.g., program quality, support, advising) in your doctoral program and information about your postdoctoral plans. To complete the DES online, enter your name as it appears in university records and your student ID number (10 digits). At the end of the survey there is a survey completion screen. If you have problems accessing the survey, please contact exitsurveys@grad.wisc.edu and include your name and student ID number. Full text of your dissertation in PDF format. This must be one file. Fonts must be embedded. Security settings must be set to “no security.” Encrypted files cannot be processed for publishing. The maximum file size that can be uploaded is 1000 MB. The PDF file name cannot contain periods (except for the .pdf extension). Instructions for PDF conversion are available at the ProQuest/UMI ETD Administrator site under the “Resources and Guidelines” tab. UMI abstract text. This abstract, preferably not more than 350 words, must be in English. You will be asked to copy and paste this text during the electronic submission steps. Optional supplementary files. These images, data, etc. are an integral part of the dissertation, but not part of the full text. Advisor and other committee members’ names. These should be listed exactly as they appear on your approved warrant. Subject category. Please choose one to three subject categories from the Subject Category list that best describe your dissertation subject area. Receipt confirming payment of the dissertation deposit fee. After you have paid the required $90 dissertation deposit fee, you will receive an e-mail receipt confirming payment. Electronic copy of the signed final warrant. Go to the ProQuest/UMI ETD Administrator site and choose “Submit my dissertation/thesis.” Select University of Wisconsin-Madison from the list provided. Create an account or login using an existing account. The ProQuest/UMI ETD Administrator website will walk you through a simple process of accepting the publishing agreement and uploading the files and information about your submission. If you need to finish your submission later, you can save your information and come back to finish. No information will be lost. At the submission step called Dissertation/Thesis Details, you will be asked to enter the following important information about your dissertation. Accuracy is essential. Title: Enter the full title of your dissertation, as it appears on the title page. Only some special characters can be used in this field. The title field does not accept subscript, superscript, or Greek letters; instead, you will need to spell these out. Select the year in which you completed your manuscript. Degree/Department Information: Select the year in which your degree will be conferred. If you are depositing during the window period and are uncertain, please contact the Graduate School. Select the degree you will receive and your program. Advisor/Supervisor/Committee Chair: Enter your primary advisor’s name exactly as it appears on your warrant. Do not repeat your advisor in the list of committee members. Committee Members: Enter your committee members’ names exactly as they appear on your warrant. Description of Dissertation/Thesis: Select categories and keywords that identify your work. Abstract: Enter the text of your UMI abstract exactly as it was approved by your faculty advisor, preferably no more than 350 words. Dissertation Deposit Confirmation Receipt: upload a PDF of the email receipt you received from the UW-Madison Graduate School fee payment website. The Survey of Earned Doctorates (SED) certificate of completion: upload the survey receipt as a PDF. The Graduate School’s Doctoral Exit Survey (DES) certificate of completion: upload the survey receipt as a PDF. Signed PhD Warrant: upload your final signed PhD warrant as a PDF. At the submission step called Notes to Administrator, please indicate if you plan to attend the optional Graduate School final review. You may choose to order additional copies of your dissertation and register copyright of your dissertation – both of these items are optional. Be certain to complete the final submit step at the ProQuest/UMI ETD Administrator website. Your dissertation MUST be uploaded to the ProQuest/UMI ETD Administrator website by 11:59pm CST on the degree deadline date in order to receive your degree in a given term. Please keep in mind that submissions are reviewed by the Graduate School Degree Coordinator in the order they were received. After you complete the final submit step, you will receive an email confirming the submission. When you submit your dissertation, it will be reviewed by a Graduate School Degree Coordinator to ensure that you have followed all formatting requirements. The Graduate School Degree Coordinator will approve and submit your dissertation to ProQuest/UMI Dissertation Publishing for microfilming and binding. The UW-Madison Library will receive a bound copy and an electronic version of your dissertation shortly thereafter. You will receive an official email notification when the Graduate School has approved your dissertation for publication. Your submission of the dissertation is final and you are not allowed to make changes once it has been approved by the Graduate School Degree Coordinator. Your submission is not completed until you receive the confirmation email from the Graduate School Degree Coordinator. As of Fall 2016, final review appointments are not required, but are optional for those students who wish to confirm in person or via Skype that the dissertation submission has been accepted and all degree requirements have been met. If you choose the Skype option you must contact the Graduate School at your scheduled appointment time. You can simply search for “UWGrad SchoolFinalReview” or “finalreview@grad.wisc.edu” on Skype to make the call. If you choose to do a final review by Skype, you MUST upload the signed PhD warrant in the Administrative Documents section of Proquest/UMI ETD Administrator website. To schedule an optional final review appointment, you must have successfully defended your dissertation, paid the dissertation deposit fee, completed the doctoral exit surveys, and submitted your dissertation electronically to the ProQuest/UMI ETD Administrator website. Final review appointments are made online using the UW-Madison Scheduling Assistant. Final review times usually take about 10 minutes. Please click here to view final review appointment availability. When you submit your dissertation and select to attend a final review, it will be reviewed by a Graduate School Degree Coordinator to ensure you have followed all formatting requirements. The Graduate School Degree Coordinator will approve and submit your dissertation to ProQuest/UMI Dissertation Publishing for microfilming and binding. The UW-Madison Library will receive a bound copy and an electronic version of your dissertation shortly thereafter. You will receive an official email notification when the Graduate School has approved your dissertation for publication. Your submission of the dissertation is final and you are not allowed to make changes once it has been approved by the Graduate School Degree Coordinator. Your submission is not complete and the process for granting your degree will not begin until you receive the confirmation email from the Graduate School Degree Coordinator. 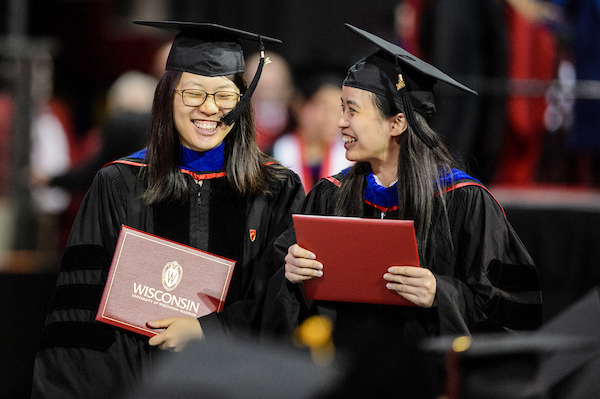 Upon completion of the Graduate School Degree Checklist, the Graduate School Degree Coordinators will begin the degree posting process at UW-Madison. If you want your name to be printed in the commencement program, you must submit an Apply to Graduate application through your MyUW Student Center. This is in addition to contacting your program to request your degree warrant from the Graduate School. You may attend the ceremony even if your name is not included in the commencement program. August does not have a commencement ceremony. If you plan to graduate in August, you may attend either the May or the December ceremony by submitting the Apply to Graduate application through MyUW Student Center. Cap and gown rentals are at University Bookstore. Guests can attend without tickets. The Registrar’s Office handles Degree Completion Letters. If you have completed all degree requirements and deposited your thesis or dissertation and are waiting until the next degree conferral date to receive your degree, you may request and receive a letter indicating that all requirements have been completed. All grades from the semester in which you are depositing your dissertation (and all other outstanding grades) must be reported to the Graduate School before you can receive a completion letter. A student may bring the completed grade change form to the final review if a degree completion letter will be needed. The Registrar’s Office will send your diploma to your DIPLOMA address approximately 8 weeks after degree conferral. Update your Diploma address via the MyUW Student Center prior to leaving campus. International students MUST enter the DIPLOMA address via the MyUW Student Center to receive their diploma. Students with holds will not receive their diploma until those holds are cleared. The Registrar’s Office posts degrees on official transcripts approximately four to six weeks after the end of the semester. You can order your official transcripts online. Once you have met your degree requirements, you may choose to attend a fall or spring commencement ceremony. Commencement occurs in May and December each year and is coordinated by the Office of the Chancellor. There is no summer commencement ceremony. If you plan to graduate in August, you may attend either the May or the December ceremony. If you want your name to be printed in the commencement program, you must apply to graduate through your MyUW Student Center by the deadline each semester in addition to contacting your major program to request a degree warrant from the Graduate School. For Master’s students, the deadline to request your warrant can be found in the Degree Deadlines. You may attend the commencement ceremony even if your name is not included in the commencement program.